Acuter Deluxe Micro Adjustable Tabletop Tripod: Compact, light weight and sturdy design of the tripod offers great utility for close up shots. Flip lock legs and terminal non slip rubber caps facilitates the tripod placement on any stable surface like table, wall and rock. Height can be adjusted from the central adjustable column. Additionally micro elevation and azimuth adjustments are also provided for finer height adjustments. Standard tripod connector makes it compatible with your favorite camera. 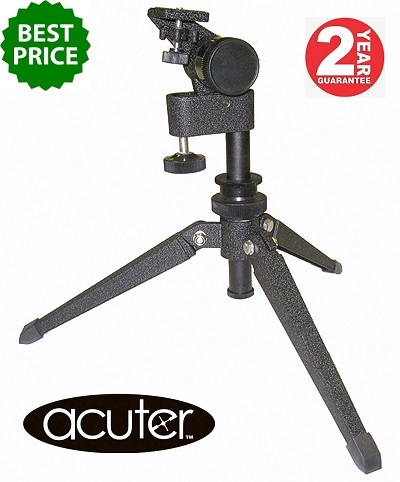 For more information about, Acuter Deluxe Micro Adjustable Tabletop Tripod website.